At our 2014 Tenth Anniversary Open House, we talked to a lot of customers who are interested in digital printing. Many of them like the softness and durability of dye sublimation, but aren’t crazy about being limited to 100% polyester garments. Lots of their customers are crazy about cotton. You, know, the fabric of our lives and all that. Take heart aspiring garment decorators. There is a sublimation-like process for imprinting cotton apparel. It’s called ChromaBlast and it comes from the same company that invented desktop sublimation so you know it works. But how does it work? What are the advantages and disadvantages compared to sublimation? What printers can I use with this system? Is it good for shirts only, or can you decorate other items? Is there a dark shirt option? These answers and many others will be provided below. Q: This process for heat transfers, is it like the old shirts of the 70’s? I’ve seen some heat transfers that end up as a big, stiff squares on your shirt. It feels terrible. Yuck! A: With Sawgrass inks, the paper is only a carrier. It isn’t stuck on the shirt. So your image is imprinted directly on the fabric. The ChromaBlast process replaces the OEM ink with Sawgrass ChromaBlast ink which is printed on ChromaBlast media. The image is printed in reverse on a sheet of carrier paper. Then it’s laid on a shirt, placed in a heat press, and pressed on the shirt at a temperature of 375 °F. The result is an image that’s as smooth and soft as the shirt. Newer ChromaBlast media can actually be applied by hand with an iron, but a heat press is more consistent and efficient. Q: How do I design the image? Can I use CorelDRAW? A: The design process couldn’t be simpler. You install a Sawgrass driver for the RICOH printer when you setup the system. (Complete setup and installation instructions come with the printer and can be downloaded from our website) You can create the design in CorelDRAW, Adobe Illustrator, Photoshop, FlexiSign, LXi, or whatever graphic design software you like. When you’re ready to imprint your design, you simply select the installed Sawgrass driver (i.e. “ChromaBlast Driver SG7100DN”) from your list of printers and send the file. At this time, you can choose the paper size and desired saturation level. When you hit OK, the file is printed on the transfer paper. Q: What is shelf life after picture is put on transfer paper? A: Sawgrass doesn’t publish a shelf life, but for maximum longevity they recommend storing prints in a sealed plastic bag. I would add that you should make sure they’re not exposed to direct sunlight. If left in direct sunlight, eventually some of the color will fade and your transfer won’t be as vibrant when you go to transfer it using your heat press. Q: How does it compare to dye sublimation? A: Since it comes from Sawgrass, ChromaBlast is very similar to sublimation. As noted above, the basic process is the same. Like sublimation, it’s limited to white, pastel or gray scale fabric. Applying ChromaBlast ink directly to a blue or black shirt is going to produce some…interesting results. There is a dark shirt solution though. More on that down the page. ChromaBlast is not as versatile as sublimation because there’s only one known non-apparel application for it. So you can’t use it to decorate ceramic tiles, iphone cases, or mugs. And it’s not quite as washfast as sublimation. Sublimated imprints generally last as long as the garment. ChromaBlast transfers are rated for about 30 washes, after which some noticeable fading occurs. In this regard, ChromaBlast cotton decoration is as washfast as most other digital garment decoration techniques including laser transfers and direct-to-garment prints. The offsetting advantage of ChromaBlast is based on that cotton thing. Cotton Tees are much easier to find and much more affordable than blank polyester apparel. Typical wholesale prices for good cotton shirts are around $2.50 each; about one third the cost of polyester shirts. So it’s a more economical way to break into garment decoration. Q: What else can you with it? A: In addition to cotton shirts, ChromaBlast ink and media can be used to decorate mouse pads. Most blank mouse pads are polymer-coated for sublimation, but the coating doesn’t interfere with the ChromaBlast ink. 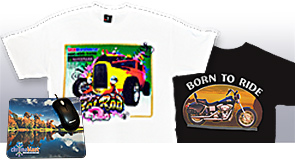 The process for decorating a mouse pad with ChromaBlast ink and media is the same as that for T-shirts. Just remember to adjust the pressure setting on your heat press to accommodate the much greater thickness of the pads. Pressing thicker items requires reducing the pressure setting on your heat press. Q: Can I use ChromaBlast cartridges in my own ink jet printer? A: Because the Sawgrass ChromaBlast HD inks require the use of the Power Driver, these inks can only be used in printers for which Sawgrass has drivers. At this time, there are two kinds of ChromaBlast ink on the market. The newest version, ChromaBlast HD ink, is optimized for use in the new Sawgrass Virtuoso SG400 and SG800 printers. The previous version, known as ChromaBlast-R inks were made for use in specific RICOH desktop printers: the GX7000, GXe3300n, SG 3110DN and SG7100DN. None of these models are still in production. If you’re looking for a new ChromaBlast system, the Virtuoso SG400 and SG800 are your next stop. Q: What is the biggest size these printers will print? A: The Virtuoso SG400 is a letter size printer with a maximum print size of 8.5″ x 14″ in the sheet tray. The SG800 handles sheet sizes up to 13″ x 19″. ChromaBlast media is available in either 8.5″ x 11″ (letter) and 11″ x 17″ (Tabloid) sheets. The 8.5″ x 11″ sheets can be used in either printer. The 11″ x 17″ sheets can only be used in the larger SG800. Q: Are there cleaning cartridges for these printers? What do I do if my business is seasonal and the printer is idle for a few months? A: There are no cleaning or flushing cartridges for the Virtuoso printers. A seasonal business model is not an issue. Our contact at Sawgrass says their demo units sit idle in boxes for months at a time between trade shows and fire up with no problem when called upon. So if you intend to sell shirts at fairs and festivals, then hibernate through the winter, your printer should be ready for business again come spring time. There is a head cleaning function on the control panel that runs ink through the head to free up clogged nozzles. One of the great features of the gel based ink used in the Virtuoso SG printers is the rarity of clogged nozzles. Q: What is the start-up cost? A: This is one of the best parts. The desktop letter size printers are extremely affordable. As noted in the first answer, a heat press is preferred, but not required. If you already have one, or wish to start using the iron-on option, you can get the printer, ink and media package for just under $600.00. A package with a starter heat press is only $799.00. There are other options including a complete package with a heat press and a case of high quality, Hanes BeefyTs. If you want to create larger images, you’ll want to start with a Virtuoso SG800. Those packages start under $1,650.00. A package with a starter heat press is less than $1,900.00. Click here to start shopping or call 800-899-5655 to speak to sales consultant. Q: I’m all the way down the page now. What about that dark shirt option? Fig 1. 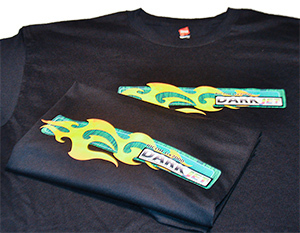 ChromaBlast ink can be used to create vivid T-shirt decals on dark garments like these black cotton shirts. A: ChromaBlast ink can also be used to imprint EnduraTex DarkJET and similar inkjet heat transfer papers. This is a print and cut process in which you print with ChromaBlast ink on the DarkJET paper with Vinyl Express LXi software. The software’s Contour Cut Mark feature adds a vector contour path and registration marks around the printed image area. Then you place the print in a vinyl cutter with a registration mark sensor and cut around the image. Weed it and transfer the decal to a cotton or cotton-polyester shirt of any color. The white face film of the DarkJET paper covers the color of the fabric and you have an opaque, colorful custom decal on your black shirt (Fig 1). Since you’ll need specific equipment, a different start-up package is required for this process, but it’s still pretty affordable. You can start with a ChromaBlast package with the DarkJET option and a great desktop vinyl cutter for under $1,500.00. If you already own the software, heat press, and a qualified vinyl cutter, you can get the Sawgrass ChromaBlast bits for under $600.00, as noted above. Please refer to our T-shirt Printing Options article for more details about this process and its possibilities. That covers all the basic information about Sawgrass ChromaBlast ink and media. It’s a great option for beginning garment decorators who want to offer their cotton-loving customers a custom printed T-shirt…or mouse pad. And since Sawgrass Virtuoso printers and cotton shirts are so and affordable, it’s a great shoestring start-up opportunity for creative people like you. Speaking of basic information, if you want a great primer on the entire digital garment decoration field, pour yourself a cup of Joe and check out our Digital Decoration 101 Webinar on SignWarehouse TV. Click here to get information about all of our Sawgrass start-up packages including dye sublimation package deals and FAQ. And if you still have unanswered questions, feel free to give us a call or post them in the comments below. Garment Decoration 101 – What Do I Charge?